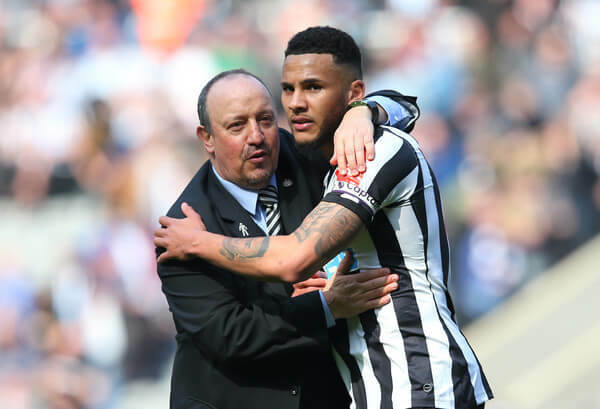 There are several good reasons why Jamaal Lascelles was the choice to be the Newcastle captain a couple of years ago when he was just 22 years-old. Rafa Benitez made the youngster captain based on his playing potential but also on his fine leadership skills. And it has paid off with Jamaal starring the last two seasons and providing some excellent leadership both on and off the pitch for Newcastle. The 24-year-old often speaks out in the press, and today he has talked about how angry he was when pundits early in the campaign last year labeled the team as a Championship side playing in the Premier League. One of the pundits who said we were only a Championship side was Alan Shearer. But as the season progressed Shearer praised the excellent job done by the manager Rafa Benitez. And the players deserve that same level of congratulations because they showed great determination and pride and the season ended up as another successful season. We hope next season is even better. These comments epitomize the pride, determination, and toughness shown by the Newcastle captain and also his excellent relationship with the fans. Lascelles’ words’ll be music to Ashley’s ears. If you’re thinking about hibernating ’til the world cup’s over, why not extend it until the end of the 2022 competition? Also shows that clubs can offer as much as they want for Jamaal, we won’t lose him if he doesn’t want to leave. The lads did a remarkable job finishing tenth. Especially when – as often as not – the starting or finishing eleven WAS the same team that got promoted. Not sure any other manager could’ve got that level of performance from them. Can’t afford to be complacent though. Rafa’s coaching improved the entire squad and now they can all proudly consider themselves established PL players, but we still need an influx of quality to progress. If we can’t get Kenedy back I hope we go for Sisto. That delivery is second to none imo. Give him a target to pick out from the wing and he does it. Dangerous winger. Count Arthur Strong at the Tyne Theatre last night. Hilarious, his best tour yet!! Tosun, agreed mate. I think if Rafa signs, Lascelles will stay regardless of what offer we get – unless Rafa wants to sell. Another season or two here will only increase his value, its like having money in the bank on a high interest rate. Let’s enjoy Lascelles while we can. If he stays with us over the summer, he’ll be gone by next summer. We won’t be able to replace him because he’s one of those fellahs who are two players, and they don’t grow on trees (think Psycho, pity we couldn’t have had him for longer; think Ibrahimovic – these guys are true leaders, and our skipper fits the bill perfectly).